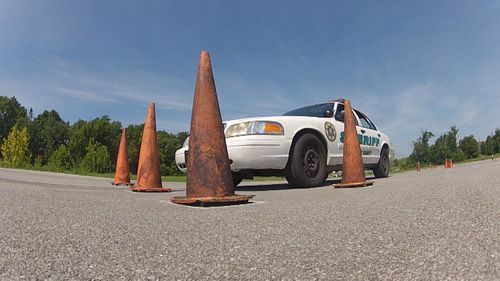 (WBIR-Maryville) The Blount County Sheriff's Office is welcoming their largest class of trainees ever. Currently, 52 people are enrolled in the 11-week program. This includes many would-be deputies from surrounding counties. "We've got to make sure they can handle themselves here, before they ever get out on the street," said training chief Tom Spangler. Spangler said even with the unusually large group, they can't relax their standards. "You've got to make sure each individual is getting that training," Spangler said. Still, they've had to move their facility to accommodate the large class, and split the trainees into 3 groups to cover their major criteria. This includes training on how to shoot, handle yourself in a fight, and tactical driving. They're taught what to do when engaging suspects, but perhaps the biggest lesson, Spangler said, is to consider the consequences. "We make them think before they turn the lights on and initiate a pursuit," Spangler said. "We give them the basic here, and the experience comes when they do it on their own."